Just recently, the Ocean Beach Town Council passed a resolution that supports the ban on plastic bags in the City of San Diego. When the Council met on November 14, it passed it in support of the ordinance before the City. More than 500 million single-use plastic bags are distributed annually in San Diego, and approximately 3% are recycled. Improper disposal results in plastic bags becoming windblown through our streets, parks, and beaches, clogging our storm drains and sewers, degrading our soils and waterways, and threatening the lives of avian and marine species. 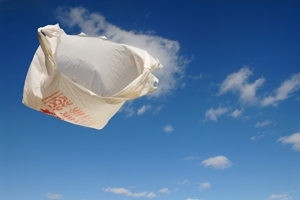 Over 70 California municipalities have enacted ordinances banning or restricting the use of plastic bags. The OBTC is committed to protecting our natural environment and the public health and welfare of our community’s residents. and we request Ocean Beach businesses and organizations to stop carrying single-use carry-out plastic bags and to join the Plastic Pollution Coalition (http://plasticpollutioncoalition.org/). Here is the full OBTC Bag Ban Resolution. we can certainly learn to live without them. What can us residents do to help this get passed? I’m fine with this, except I’m an old lady with a bad back and have Vons deliver my groceries instead of hauling them. They are delivered in plastic bags. Paying extra for the bags won’t change anything, because many times they arrive with things that leak. When I shop for things in small quanities I use a cloth bag. I don’t think I could support a total ban because it will be more of a handicap for people like me. I know many a people who use these plastic bags to pick up after their dogs. If plastic bags get banned, don’t be surprised if you are stepping on dog feces more often. Having a pet means taking on that sort of responsibility. Remember, people had pets and groceries long before we had single use plastic bags. It won’t be that hard. How about making the tee-shirt bag of compostable “plastic” too? Where are the factories that make them? Used to be made in Israel. How about re-engineering the bag to use less plastic? How about a string bag? How about making them of hemp? Oh, that’s right. Can’t grow that! Somebody might be arrested for smoking a bag. What have other cities done that banned plastic bags? My own personal opinion is that, I’m not a huge fan of banning things outright. But living by the coast, we see first hand the damage being done by these bags. They are almost never recycled, and there are so many better options which are just as convenient. I still have plenty of these bags clustered under my kitchen sink that I try to reuse, so I’m no absolute purist. But I think the fact I can’t run away from them as hard as I try speaks to the need to get rid of them altogether and focus on more sustainable conveniences. Okay, I looked up the bio-bag, made in Florida with an Italian technology. There are few instances where they might not compost, and our landfills may not compost. I am ignorant of the San Diego landfills. San Francisco businesses, according to the website, use these bags, and they are approved in California. Thanks, Jon. Very informative site.